August 2013 | La-med Healthcare Pvt. Ltd.
For introduction through nasogastric route for aspiration of intestinal fluid or for administration of enternal nutrition. X-Ray line facilitates detection during passage to duodenum. Four lateral eyes are provided for efficient aspiration and administration. 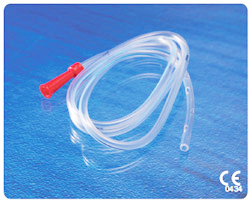 Colour coded Universal funnel shape connector for easy identification of sizes provided at proximal end. Made from non-toxic, medical grade P.V.C. material.